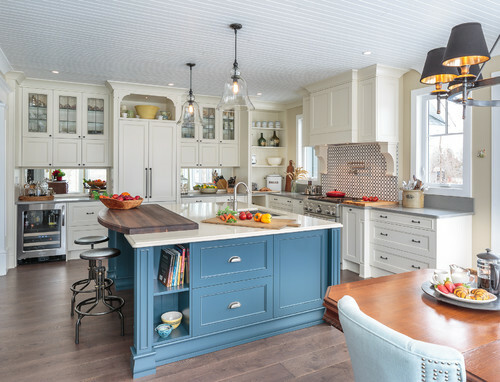 If you follow our project blogs, or other home improvement resources like Houzz.com, you know that painted kitchen cabinets are hugely popular. And, unlike more fickle trends that come and go in a flash, this one just isn’t going anywhere. Painting your cabinets opens the doors to endless options, possibilities, and combinations that can be tailored to your specific home. Working with your professional painting company is a fun opportunity to add real value and style in a cost-effective way, while radically transforming this central space. And, it all starts with just a bit of inspiration. What Are the Most Popular Kitchen Cabinet Colors? White and grey are leading the pack. While they might not be the most visually exciting all on their own, they offer a timeless neutrality. And, with this neutrality comes the ability to mix in other colors and textures without making the space busy. Above and below are examples of recent projects we’ve completed that showcase exactly how much style a clean, white finish can deliver. What Else Is Trending in the World of Kitchen Cabinet Color? Make your island a statement piece - If your cabinets are neutral, your island could be your ticket to introducing vibrant color in a limited way. Different colors for your upper and lower cabinets - Typically a darker color is chosen for the lower sections and a light option for the upper cabinets. This is an attractive way to mix up the palette a bit. Add something natural - Natural wood shelving, stools, or even a section of butcher block countertop (perhaps on your island) adds a nice touch. This is very stylish, and it also can work well with a variety of surrounding colors. As we touched on above, the very best decision you can make is to find and partner with a quality local painting company. There’s no margin for error or grace for amateur work when it comes to your cabinets; they can be tough surfaces to smoothly transform in a truly lasting way. If you live here in the Bay Area, be sure to contact us at MB Jessee! It would be our pleasure to serve you.